January | 2017 | What Next? 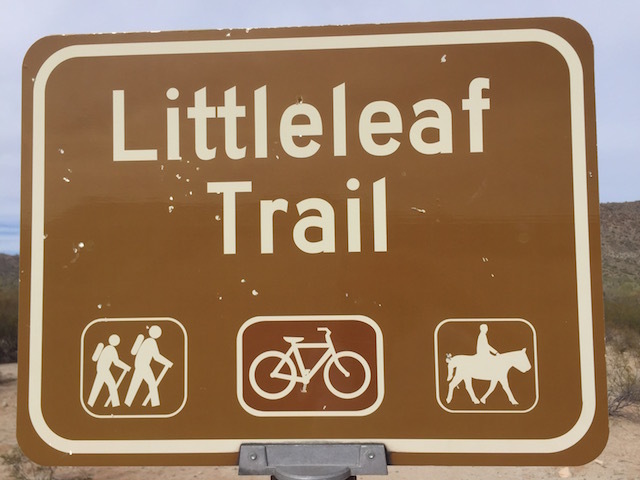 Trails in the San Tan Regional Park where we have been doing a fair bit of hiking are open to cyclists, hikers and horse back riders. 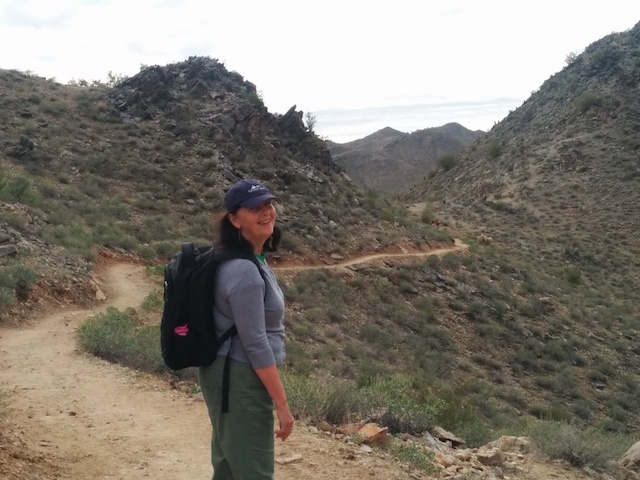 In order to make the hiking paths as safe as possible park officials have made it clear who takes priority on the trails. Horses rank number one. Every one else must give them the right of way. Hikers are second in line. They must yield to horses but not to cyclists. And cyclists are on the bottom rung. It is their responsibility to yield to everyone else on the trail. 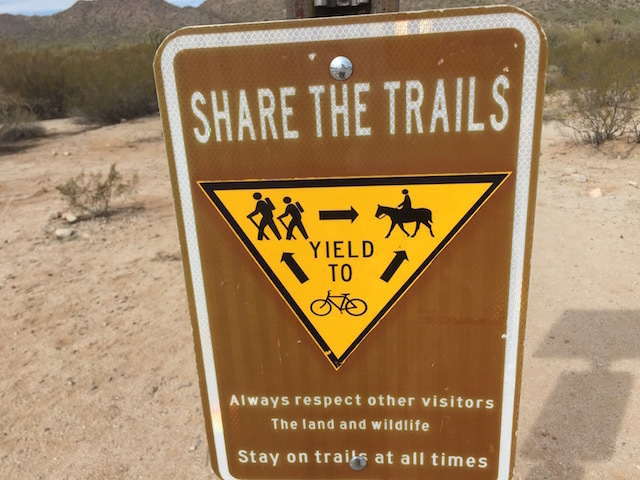 So far riders, bikers and hikers on the trails have all been extremely polite and friendly and following park etiquette admirably. But I guess you know you are out west when horses are ‘top dog’. La La Land has been nominated for a record number of Oscars. We saw it last week. Why has the movie become so popular? I think one reason is because it shows two young people following their dreams and their dreams come true. Sebastian dreams of owning and running his own jazz club and Mia dreams of being a serious film actress. They both go through many struggles on the way to achieving their dreams and they have to make compromises. Sometimes they are close to giving up but they don’t. I know plenty of people who start out following their dreams and then often for very practical, understandable, good reasons they give up. I think people like La La Land because its characters didn’t give up. Another reason I think people like La La Land is because Mia and Sebastian understand each other and are each other’s biggest cheerleaders when it comes to following their dreams. Many dreamers give up on achieving what others might deem the impossible because they don’t have enough support from the important people in their lives. Mia and Sebastian believe in each other and push each other to not give up and in the end their dreams come true. I am one of those multitudes of movie goers who liked La La Land perhaps because even in my mid sixties I still have dreams and I have realized the importance of having people in my life who can understand those dreams and believe along with me that they will become a reality. 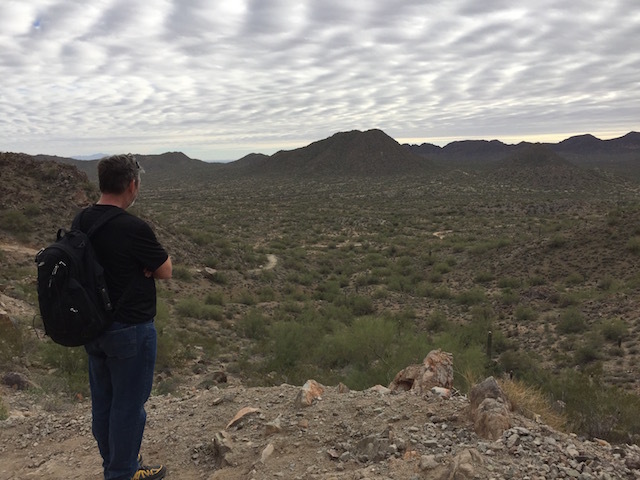 On our visit to the Phoenix Art Gallery I wanted to concentrate on finding art that told the story of the southwestern part of the United States. This stunning piece called Majestic Cat is by Tom Palmore. He specializes in paintings that include wild animals and look almost like photographs. By putting the animals in a setting that has connections to the human world he wants to remind the viewer that we share our planet with other beings. The southwest Sonoran Desert is home to many mountain lions. Artist Lew Davis was born in the copper mining town of Jerome, Arizona. The Phoenix Art Gallery has a whole series of his paintings which depict life in a copper mining town including this rather haunting one of a young boy called Little Boy Lives in A Copper Camp. Georgia O Keeffe is probably the most famous artist of the southwestern United States. She lived and worked primarily in New Mexico and painted many pieces that depict canyons. This one called Canyon Country was painted in 1965. Although the Grand Canyon is the most well-known of the southwest canyons there are an abundance of canyons throughout the area. Like Georgia O Keeffe artist Paul Pletka lives and works primarily in New Mexico but he studied at the University of Arizona. This piece of his called Our Lord The One Who Is Flayed shows a group of Mexican people reenacting the passion of Christ during Lent. The painting has images from the biblical story of the crucifixion as well as the story of the Mexican deity Xipe Totec the god of renewal. Dave, my brother and our art gallery guide check out a recreation of the Colorado River by artist Maya Lin. It is called Pin River and made up of thousands of metal pins pushed into the wall. The artist digitally mapped the topographical lines of the river and then recreated it. Part of the Colorado River flows through Arizona’s Grand Canyon before emptying into Lake Mead on the Arizona Nevada border. I was particularly interested in Phoenix artist Ed Mell because he taught for a time on the Hopi Indian Reservation just as we did. This piece of his is called Sweeping Clouds. The Phoenix Art Gallery provides a good introduction to art of the southwest. Are You Sure They Aren’t Photographs? Dave and Hans ready for the walk. At the invitation of our friend Hans, who lives not far from us here in the San Tan Valley we went on a photography walk to see the Arizona sunset. 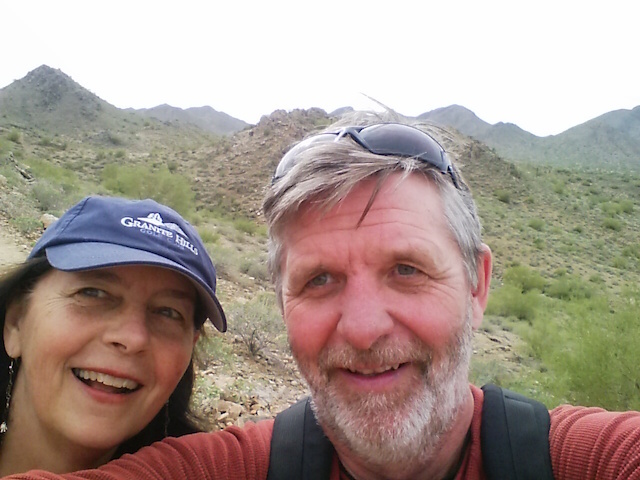 The walk was in Lost Dutchman State Park an Arizona park we had never visited before. Hans gets ready to take a photo beside a saguaro cactus that we learned weighs 10 tons. We hoped it wouldn’t fall on him! Hans who belongs to a photography club carries all kinds of photography equipment along with him on these adventures. We even had to turn the car around just after setting off for the park to go back for stuff he had forgotten. I’m sure the photos he took on our walk were stunning and I am looking forward to seeing them. We were on the walk with forty-five other people. When we introduced ourselves we found out there was one other couple from Canada. They live near Ottawa but otherwise our group had visitors from more than a dozen different American states. Barb, a park volunteer was our guide for the walk. She has a comb pick in her hand. She told us this is an essential tool for a desert walk because it helps to get unwanted cacti burrs off your clothing without hurting your hands. Barb stopped to point out a whole bunch of different plants and trees on the hike. These are hedgehog cacti. Early in our walk we got our first view of the snow-capped Four Peaks way off in the distance. They are part of the Mazatzal Mountains. Only one of the four peaks has an official name-Brown’s Peak so I wondered what we could call the others. Perhaps one should be named the Amethyst Peak since our guide Barb told us that between the third and fourth peak is the only commercial amethyst mine in the United States. Helicopters take supplies in and minerals out. The miners hike nine miles to work and usually spend about a week at a time at the mine site which has no running water or electricity. Hand tools are used to extract the amethyst. Because we were on the hike with Hans we actually got a picture of the two of us together. During our two-hour walk it was interesting to watch the sun change Flat Iron, the rock formation behind us. Formed by volcanic activity some 25 million years ago it is a pillared mesa. Here Barb is showing us some mistletoe growing on a tree. Desert mistletoe will eventually kill a tree but it can take 10 to 15 years to do so. The parasite is spread from one tree to another by birds who wipe their bills on branches or deposit droppings on the tree after eating the mistletoe fruit. Mistletoe is just a fact of life in the Sonoran Desert and there isn’t much you can do about it. Don’t Dave and Hans look fascinated with all the facts they are learning about the mistletoe? At this point in the evening Flat Iron reminded me of the red rocks you see in the Sedona area. This rock formation has been dubbed The Praying Hand. It is a favorite ascent for rock climbers. I thought the formation on the bottom left here looked like a hand too and in the one in the centre I could see a face with eyes, nose and mouth. Later in the evening the light on the distant mountains reminded me of that line from God Bless America about the purple mountains majesty. The song was written using the words from a poem by Katherine Lee Bates. She and her life partner Katharine Coman were fellow Wellesley professors who traveled often to the American West and were tireless advocates for America’s poor. The rock formation in the background of this photo figures prominently in a First Nations legend that tells the story of a group of people who escaped a flood by climbing to its peak. The white line on the rock shows how high the water came. See the hoodos to the left? They are tall thin spires of rock also called fairy chimneys or earth pyramids. There is also a tragic modern story associated with this rock formation. On Thanksgiving in 2011 a plane crashed into it killing six people including a father and his three children. As we neared the end of our walk the sun truly set and we got some colourful views. The news is just full of all this rhetoric about a divided America and so it was kind of reassuring and lovely to hike through the sunset with this huge group of people of varying ages, from varying cultural backgrounds and various geographical regions in the United States who were all so friendly and enjoying nature’s spectacular show together. I just finished reading three novels written for young people. Each one is historical. Since I am writing a novel set in 1907 I was eager to get insight into how to best craft a story set in the past. 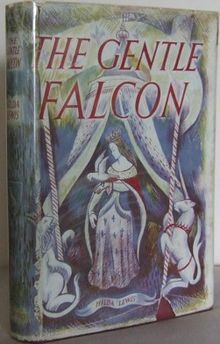 The Gentle Falcon by Hilda Lewis takes place in the 1300s and tells the story of Isabella Clinton a girl chosen to be a special companion to the French child bride of England’s King Richard II. The book starts off in an interesting way as we meet Isabella and learn about her life and the adventure she is about to begin. However the middle section of the book seems too bent on getting in all the historical details of Richard II’s life. It took the focus off the main character too much. Reading The Gentle Falcon reminded me that story and character development is more important than covering all the historical facts. 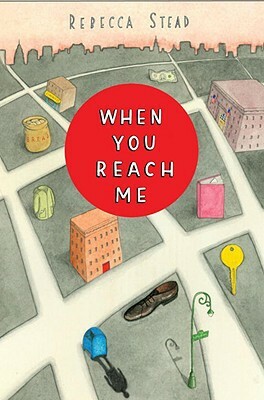 The second novel I read was When You Reach Me by Rebecca Stein. It is a Newberry Medal winner set in 1979. The book is about a New York girl named Miranda and her life at school, home and in her neighbourhood. She is trying to figure out who is sending mysterious letters to her. From reading this book I learned it is much harder to write a novel set just decades ago than a novel set more than a hundred years ago. Because many things in 1979 were similar to the present it is harder to establish the unique historical context of the story. I think the author might have included more references to things unique to the 70’s. It reminded me to check every detail of my manuscript to be sure I don’t have references that are too generic or modern and plenty that are unique to 1907. The third novel I read was Tuscon Jo by Carol Matas. 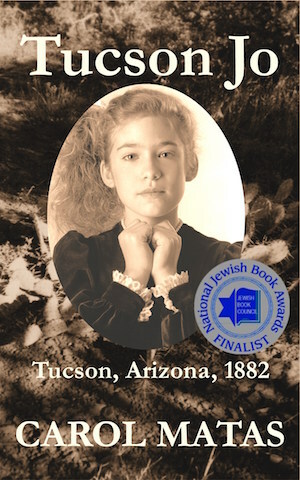 It is set in the 1880s in Arizona and is a fictional account of the family life of one of Tuscon’s first mayors. We really get to know our main character Jo, the mayor’s daughter very well. The real mayor whose life inspired the story was Jewish and Jewish faith and culture is given lots of emphasis in the story. I found out later that the book’s publisher specializes in Judaic literature. I learned you sometimes have to write your story in a way that will bring it to the attention of a certain publisher. In an afterword Carol Matas said she moved some of the events around in time to make the story better. It is important to remember when you write historical fiction that you can do that. My brother went home yesterday and so I’ve lost my intrepid hiking buddy. He was always willing to head out on the Arizona trails with me. 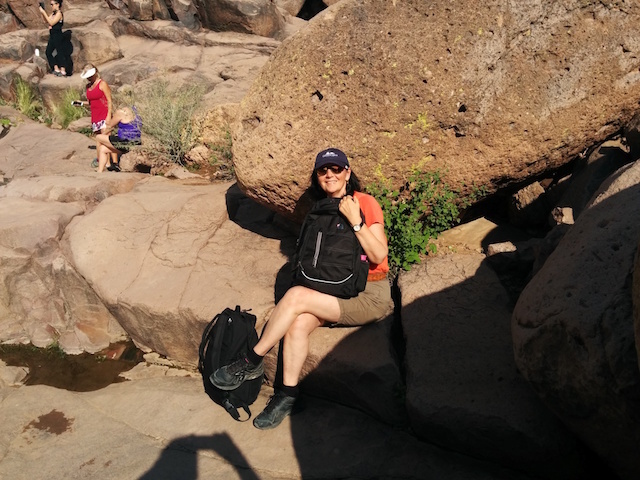 I wore out my old pack back while hiking with my brother and had to get a new one. I’m modeling it here. It is so light and roomy. I just love it. 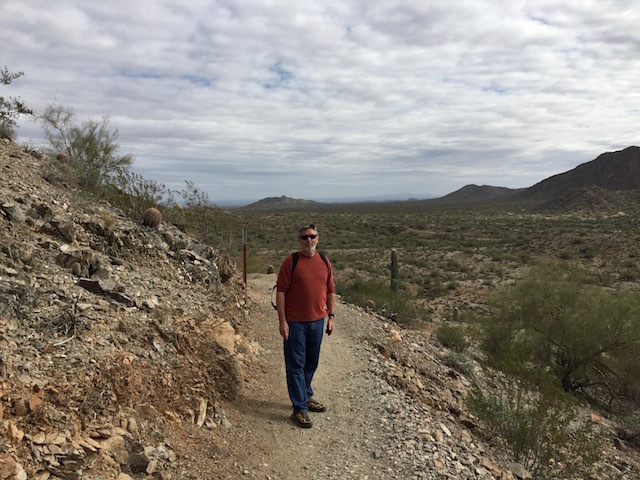 When my husband Dave was on the pickle ball court or golfing or playing baseball or watching football my brother and I would head out on a hike. The views were spectacular but my was it ever steep. On the upward trail I had to do parts of it a hundred steps at a time and then stop to catch my breath and on the downward trail I admit I had to hold my brother’s hand in sections where there were lots of loose rocks and a very steep descent. We hiked nearly ten kilometers and most of it was up or down. I am sorry to have lost my hiking buddy now that my brother is gone. My sister is coming tomorrow however and I think she might be willing to hike too. First though I will have to get new running shoes. I wore my old ones out while hiking with my brother. Looking for a great little series on Netflix? Look no further than detectorists. We just finished watching two seasons worth and what a gem it was. We so enjoyed it! 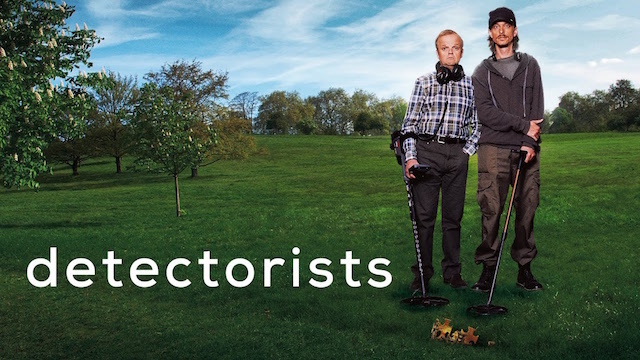 The series follows a group of hobby detectorists in a British village. They have a metal detecting club and look for historical treasures in the surrounding meadows and fields. They meet regularly to share their findings. I liked the way the series showed the caring but understated relationship between the two men who are the main characters. They are passionate about their hobby. Both are experiencing personal crisis and their metal detectoring is a way of dealing with it, a kind of therapy if you will. I found the espisodes charming and heartwarming. Each member of the metal detecting club has a unique personality and when they interact it makes for some great humour. I don’t know when I have laughed out loud as many times as I did watching this series. My husband Dave liked the soundtrack and the great cinematography which highlighted the pastoral English countryside in a beautiful way. My brother said he enjoyed the nuanced gems of human interaction in detectorists. He found the characters to be quirky but definitely relatable and said there was a kindness about the show that so often is missing in television programs. He liked the gentle pace and the way the stories unfold fluidly not in a jerky fashion as so many television programs do. He thought the writing was great. If you were a fan of the old British series The Avengers you will appreciate the cameo performance by one of its stars Diana Rigg in detectorists. Diana’s daughter has a starring role in the drama and is just as dynamic an actress as her mother. While watching the series I learned that it is important to distinguish between a detector and a detectorist. A detector is the actual metal detecting machine and a detectorist is the person who operates it. Breaking Bad- What’s to Like?